BBC coverage: Across TV, radio and online with up to 15 live streams. Read More: TV and radio schedules. 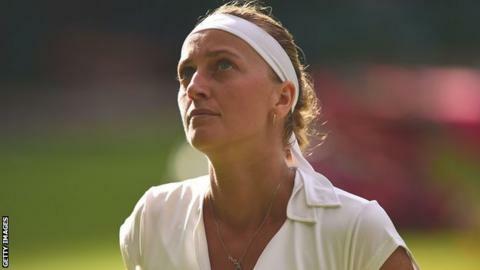 Petra Kvitova says she is at a loss to explain the surprise third-round loss to 28th seed Jelena Jankovic that ended her Wimbledon title defence. The Czech, 25, was beaten 3-6 7-5 6-4 after dropping just three games in her previous two matches at the tournament. "I'm not really sure what happened," said the world number two. "I was just missing it. It was really unusual or weird. I was still waiting for some chance, and it didn't come unfortunately." Kvitova has defeated Kiki Bertens and Kurumi Nara in imperious style in the first two rounds, and appeared set for another straight-sets win as she comfortably won the first set in 29 minutes against the Serbian former world number one. But, after taking an early break in the second set, Kvitova's serve faltered to allow her opponent back into the match and she found herself unable to contain the resurgent Jankovic in the decider. "I felt like she was coming back, playing a little bit aggressive," Kvitova added. "Suddenly, from my side, I didn't have an answer for it. My serve didn't help me at all this time. I was really struggling with each shot which I played. "It's tennis. I'm still human. I'm not a robot." Eighteen-time Grand Slam champion Martina Navratilova told Wimbledon 2Day that it was "a problem" that Kvitova seemed unable to identify exactly where the match was lost. "It was like two different matches. Kvitova was cruising, but I think that the weather was hard on her physically," Navratilova said. "She struggles with asthma to get the air down into her lungs, starts trying to conserve her energy and gets slow around the court - not taking that extra step. "Jankovic defended really well, but Kvitova was not positioned offensively enough. She just looked a little low." Jankovic, who spent 18 weeks at the top of the rankings between August 2008 and February 2009, will make the women's singles quarter-finals of Wimbledon for the first time if she beats Poland's Agnieszka Radwanska on Monday. The 30-year-old said that she managed to get the upper hand against Kvitova by staying calm and denying her the chance to unleash baseline winners. "I change a little bit. As the match was going on, I was starting to feel better and better. I was moving better, timing my ball a lot better and hitting deeper," she said. "I tried to not give her a lot of angles and served very well." What's on - and when?